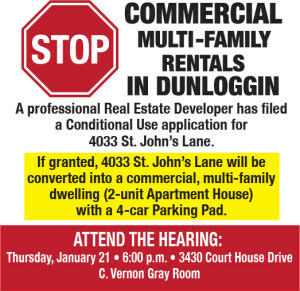 Howard County has recommended granting a conditional use application for 4033 Saint John's Lane to become a two-family dwelling with a front yard parking lot. Is this what you want in your neighborhood? 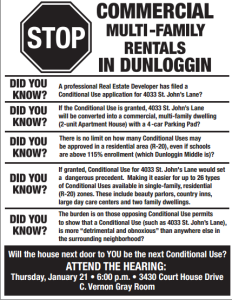 Approval of this application would set a dangerous precedent for the rest of the Dunloggin. Please view the flyer and plan on attending the hearing for BA 14-031C, Lorman Lykes, scheduled for Thursday, January 21 @ 6:00 p.m. in the C. Vernon Gray Room at the George Howard County Office Building.